82 • October 2014 • S I G N & D I G I T A L G R A P H I C S ELECTRIC SIGNAGE EXHIBIT & DISPLAY Most exhibit manufacturing com- panies, including MAXatrax, now offer backlit fabric display systems. Depending on what your needs may be for a spe- cific design, you should have no problem locating the system to fit your needs. Methods of Attachment If a backlit system is created from aluminum extrusion, you will generally have your choice of silicon-edged graph- ics, Velcro-attached graphics, or slip-over "pillowcase" graphics. Backlit systems employing each of the three attachment methods are readily available within the industry today. Fabric as Walls Fabric is also being used to create faux wall surfaces. The printed graphic may be of a brick wall, wood, expanded metal, flora, or about anything else that you can imagine. Most fabric walls do include a support frame system; however, simple printed fabric panels and banners may be hung from most any type of structure, truss, wires, etc. Avalara uses this 10' VIVID backlit display system, manufactured by MAXatrax, at most of its shows, either as a stand alone display or as an integrated component of its larger exhibits. 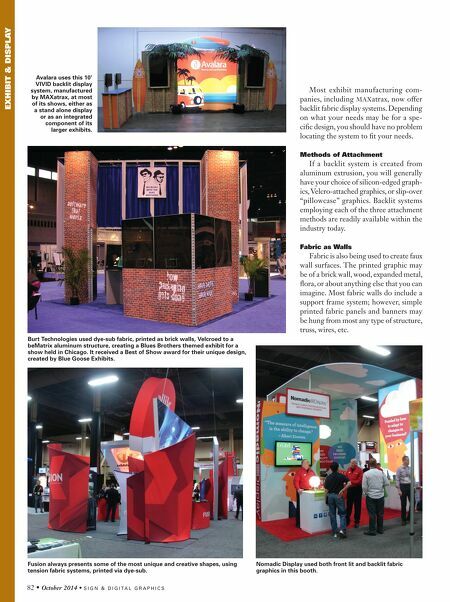 Burt Technologies used dye-sub fabric, printed as brick walls, Velcroed to a beMatrix aluminum structure, creating a Blues Brothers themed exhibit for a show held in Chicago. It received a Best of Show award for their unique design, created by Blue Goose Exhibits. Nomadic Display used both front lit and backlit fabric graphics in this booth. 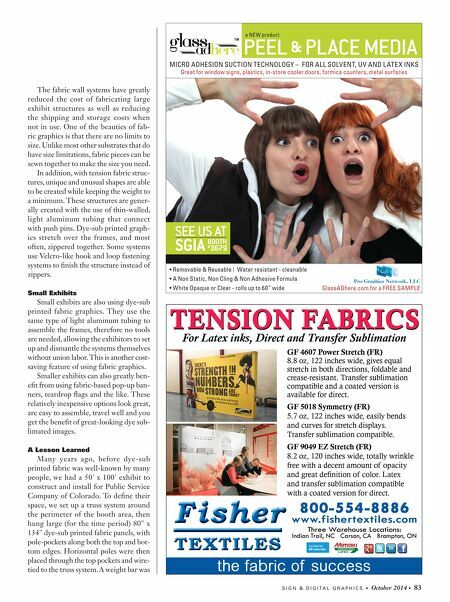 Fusion always presents some of the most unique and creative shapes, using tension fabric systems, printed via dye-sub.